(RNS) – When Yadira Thabatah converted to Islam 13 years ago from Catholicism, she was eager to learn everything she could about her new religion. The only thing slowing Yadira down was that the 34-year-old mother of four living in Fort Worth, Tex., was born blind. When she and her husband, 33-year-old Nadir Thabatah, who is legally blind but has partial vision, looked for high-quality, English-language resources that she could read, they found nothing. So in 2017, she and Nadir decided it was time for some DIY action. They spent eight months converting a popular English-language translation of Islam’s holy book into braille characters, then used a crowdfunding site to raise money to buy a braille embosser and began producing Quran translations right in their garage. In the past three years, under the auspices of their nonprofit, Islam By Touch, the couple has sent more than 150 braille Qurans to U.S. mosques for distribution to visually impaired Muslims as well as to individuals directly. They have also launched an app to help visually impaired Muslims learn about their faith. 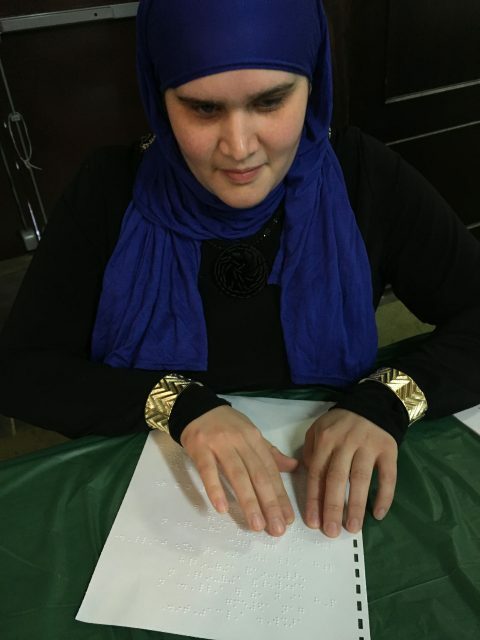 The first time Yadira was able to read the Quran for herself was when she was proofreading her own braille rendering of an English translation. Other Muslims had recommended audio tapes of Islamic literature over the years, and Yadira did listen to plenty, as well as CDs with translations of the Quran. They got the job done, she said, but she still longed to read the Quran with her own hands. My larger point was to question why Muslims invest only men with the authority to interpret the Qur’an and why they are averse to interpreting it differently than they do. I have read it as an egalitarian and anti-patriarchal text in Believing Women in Islam: Unreading Patriarchal Interpretations of the Qur’an. At the end of the debate, several women in the audience asked Ramadan what he thought about women’s readings of the Qur’an. Women, he eventually said, had to achieve a certain mastery in order to be able to comment on it knowledgeably. All these years later, I can still recall the incensed face of a young woman in hijab who was repeatedly pushing him to clarify just how many more centuries he felt women had to wait before men would regard them as being knowledgeable. He didn’t say. The truth is that the Qur’an doesn’t authorize only men or a scholarly community to interpret it and nor is there an ordained clergy or church in Islam. Nor does the Qur’an say it came only for the literate. To the contrary it says it is meant also for the “unlettered” Bedouins in the deserts of Arabia. In a remarkably post-Reformation vein, it insists that believers should have a direct relationship with God and should rely on our own reason and intelligence to decipher its verses (ayat, or “signs” of God). God made Jack Miles because God also loves someone who loves stories. In his 1996 Pulitzer-prizewinning God: A Biography, Miles approached the Hebrew Bible as one might approach a body of literary work produced by Yahweh-Elohim, the Lord God; in a follow-up 2001 book, Christ: A Crisis in the Life of God, he undertook the same task with the New Testament, focusing in particular on the four Gospels. Holder of a Harvard doctorate in Ancient Near Eastern Languages and Civilizations, Miles left the Society of Jesus before undertaking formal theological studies; yet his Jesuit education, tracing back to his days in a Jesuit high school in Chicago, equipped him to comprehend multiple languages and their literatures: English, Latin, Greek, French, German, Italian, and Spanish; but also Hebrew, Aramaic and, last but not least, Ethiopic (Ge’ez), the ancient Semitic language of the Horn of Africa. He has enjoyed a long career as a Distinguished Professor of both English and Religious Studies at the University of California, Irvine. Miles admits that he does not know Arabic very well, but his background in other Semitic languages and his careful comparative study of various English and other renderings of the Qur’an allows him to read it with notable sensitivity. Most of the stories told at some length in the Qur’an that have biblical resonances find their parallels in the Torah, especially Genesis and Exodus. Thus do Adam and Eve, Cain and Abel, Noah, the family of Abraham, the patriarch Joseph, and Moses appear on stage again to play their parts in the Qur’an. Jefferson’s personal copy of the Quran drew attention in early 2019 when Rashida Tlaib, one of the first two Muslim women elected to Congress, announced she’d use it during her swearing-in ceremony (she later decided to use her own). It’s not the first time a member of Congress has been sworn in with the centuries-old Quran—Keith Ellison, the first Muslim Congressman, did so in 2007—yet its use highlights the long and complicated history of Islam in the U.S.
Christmas has been described as the greatest story ever told. A child born in a stable following a miraculous conception, who is visited by kings and shepherds, while being hunted down by a cruel king, it is a tale that has inspired film-makers, artists and poets. Yet many elements of the story have been open to debate with even the Christian gospels giving contrasting accounts of the birth. Karl-Josel Kuschel’s book, Christmas and the Quran, is a passionate endeavour to understand the different narratives given around the Christmas story (or stories) and put these in context. Kushcel, a Professor Emeritus of Catholic Theology at the University of Tubingen, puts forward an ecumenical message to help bridge differences between Christians and Muslims, both whom revere Jesus, or Issa in Arabic. Kuschel’s book is divided into six sections, to explore the narratives of Jesus’ birth. The chapters are divided into the “Birth of Jesus in The New Testament”, “The Birth of Muhammad”, “The Birth of John the Baptist in the Quran”, “Mary – God’s Chosen One”, “The Birth of Jesus in the Quran”, and ends with “A Call for Dialogue”. Kuschel uses the gospels of Mathew and Luke and Surahs 3 and 19 in the Quran as a framework to show the Muslim and Christian understandings of Jesus’ birth. Rather than highlight contradictions, Kuschel says that the stories illustrate the shared fundamental message in Islam and Christianity of God’s power and mercy. He begins by acknowledging that the nativity has echoes of other creation stories in history, but the humble beginnings of Jesus – among other elements – make the Christmas narrative unique. It is preceded by the birth of John the Baptist, who will play a role later in both the Bible and Quran. FAYETTEVILLE, N.C. — When Jason Criss Howk’s Army career came to an end in 2015, he thought he’d spend his days teaching and fishing. But a wake-up call at a Pinehurst library changed those plans. And while Howk does teach, he’s found a new mission, too: Explaining the Middle East, Islam and Muslim culture to a population that has little experience, but strong opinions on those topics. At times, it has been a combative undertaking. Howk has spoken at small rural churches across the Southeast and has, on occasion, had to be escorted to his car by church leaders at the end of the night. But that hasn’t stopped his one-man mission to better educate America and, in the process, help promote tolerance. His efforts have expanded since he retired. In 2017, he published “The Quran: A Chronological Modern English Interpretation” through Old Stone Press. The book is intended for audiences that have little familiarity with Islam, the Quran or Muslim culture. Howk’s interest in Islam is tied to his experiences as a soldier. He served as an enlisted paratrooper in the 82nd Airborne Division in the 1990s and returned as an officer a decade later.